“What do you want to be when you grow up”? a question often asked to all young boys and girls. Now the answer would probably be a member of a boy band or anything related to being a celebrity, but back in the 1950’s things were different, the reply from a boy would more than likely be a Train or Bus Driver! Before the Beeching cuts of the mid 1960’s the railways were everywhere so it was not uncommon for anyone to live fairly close to a railway line. 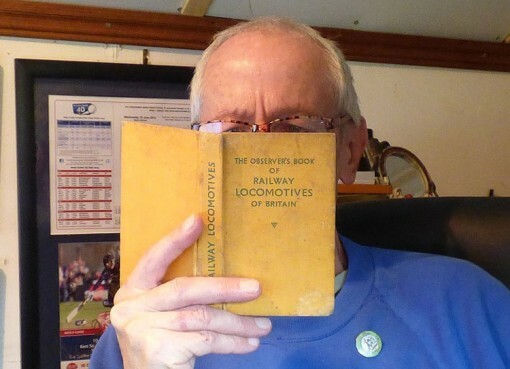 Trainspotting was one of the most popular hobbies amongst young boys who would crowd the ends of platforms at whatever Station to record Steam Engine number’s in their Ian Allen books. I was there ! Sevenoaks was my closest Station. On weekdays I would walk the half a mile from my house to meet my Father off his commuter train, but getting there some one hour beforehand to record any numbers I hadn’t already got. You were supposed to buy a Platform Ticket, but usually, if you said to the Ticket Inspector you were meeting your Dad, he’d let you through. Weekends were different of course, I’d get down there after ‘Saturday Morning Pictures’ and park myself as far coast side of the downside platform as I could and wait for the thundering Boat Trains being pulled by Brittania Class locos, it was not uncommon for them to go past at 70mph plus, the vibrations would roar up your back, the smell of coal smoke and hot oil would enter your nostrils and stay there for a good two hours or more. Being on the main London to Dover line, many Boat Trains would come through either heading for Dover Western Docks or Folkestone Harbour to link up with a Cross Channel Ferry. During all School Holidays, every Thursday we would go to my Grandparents house in Tonbridge. My Grandfather and myself would walk accross the fields next to Judd School and join the railway lines at the Jubilee Sidings. There we would watch a few good shunting movements then stroll around the footpaths to watch from a bank next to the Station. With it’s junctions for the Redhill and Hastings, more versatility was there plus at that time there was still a branch line from Paddock Wood to Goudhurst and further down the Hastings line, a junction for Bexhill. Definitely never a dull moment. So what was it about trains which tuned almost every boy on to them? I guess it has to be a number of things; the power, the noise, the smell and although we may not have said it, it was the romance, trains would pass you by leaving to your imagination what people were on it and where they were going to. Having no Computers and not all having a TV Set even, the imagination of a child was different. I remember wherever I went on my bicycle, it would become my train; I had Stations at various points along my cycle route, some I’d stop at and patiently wait for the passengers to get on and some would be a thunderous roar non stop as I made my way to whatever destination I had in mind that day. Nowadays you may see the odd Trainspotter on Stations but needless to say most of them are my age and if not, they have a reputation of being a Geek, or as we called it on the railway ‘GANGY’ (Green Anorak, no girlfriend yet). You won’t see any young lads in a pack of 10 to 15 standing on the end of the Platform with their Trainspotting Books and Notepads in their hands; it’s not the done thing now and health and safety overkill would probably see them being moved on anyway. Those were the days as they say, days when we made our own entertainment, lived around our imagination and still got change from a ten bob note ! !